Machine translation post-editing is the process of improving a machine-generated translation with minimal manual labour. It is a new skill which many translators are not familiar with. However, with a bit of practice, it can speed up the process dramatically. Machine Translation (MT) is a type of automated translation. It is the process by which computer software is used to translate a text from one natural language (such as English) to another (such as French). It is one of the oldest applications of artificial intelligence. It facilitates and accelerates the creation of translated materials. MT, however, does not and cannot replace human translation. Rather, it only helps with the heavy lifting of translation while translators do the editing and quality assurance. Is post-editing the same as review? Not really. 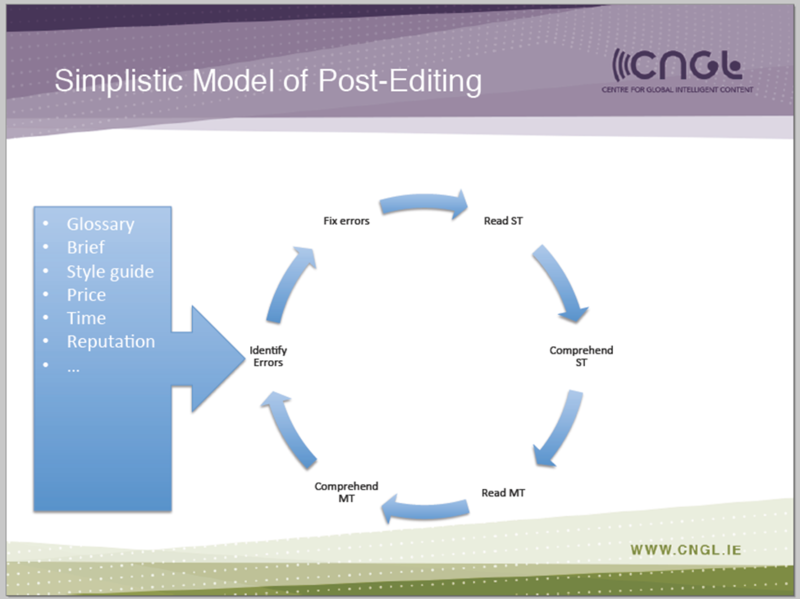 But how is post-editing (PE) different from review? PE is not just a light review. Correcting machine translated output is very different from reviewing human translation. The review stage, if required for a project, follows the post-editing stage. Now more than ever, language is a business requirement. An estimated three quarters of web users take advantage of free translation tools thanks to the greater accessibility and integration of MT solutions. Over 90% of non-native English speakers use MT software to translate English websites they visit. Nowadays, businesses need their websites to cover a wider range of languages in order to reach 90% of the world’s most economically active areas. The world of localization has also witnessed an enormous growth in digital content. Post-editing machine translation is important to translators and to today’s translation industries as it allows companies to join the fast-track MT highway and to successfully deliver their product to a growing global audience. While an average conventional translation output is 2000-2500 per day, with post-editing, productivity levels can potentially peak at 6000 words or so per day. Post-editing takes place after the translation has been done. The post-editor, who is generally a linguist and translator, performs a linguistic quality assurance (LQA) to make sure that the translation is clear, correct and concise. They read the source text, try to understand the source text, read the machine translated text, try to understand the MT, identify the errors and fix the errors. Aim for grammatically and semantically correct translation. Basic rules regarding spelling apply. Ensure that key terminologies are correctly translated and that untranslated terms belong to the client’s list of “Do Not Translate” terms. Edit any offensive, inappropriate or culturally unacceptable content. Use as much of the raw MT output as possible. Post-editing translation still poses a challenge to translators today because of its technicality. If the subject matter is too technical, a translator who knows nothing about MT would find it hard to understand the content and may not be able to edit it properly. However, undergoing some training in machine translation technology, translators should be competent to do machine translation post-editing. This is just one of the various skills and objectives that are covered on the TCLoc Master’s program.